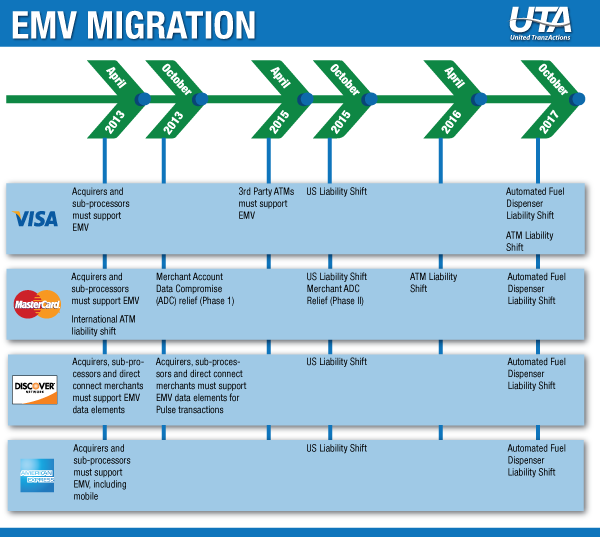 With a major deadline less than a year away, UTA is gearing up for the conversion of the payment industry to the Europay-MasterCard-Visa (EMV) chip card standard. The EMV standard is a development of Europay, MasterCard, and Visa to ensure global interoperability for chip-based payment transactions. An upgrade to the EMV enables more secure transactions across cards, contactless, mobile, and remote payment channels. Since its introduction in 1996, EMV has been implemented in many countries of the world. EMV Compliant terminals require for a digital certificate to be assigned to the terminal. The credit card processor will serve as the terminal’s sponsor and will assign the primary digital certificate. Although multiple certificates may reside within one terminal, all digital certificates are hierarchically related to one another. Under the rules of the certificate hierarchy managed by the terminal, a lower-level check certificate must always be authenticated under the authority of a higher-level credit card certificate. This rule ensures the overall security of the terminal. As of now, UTA currently supports the VeriFone VX520, an EMV compatible terminal. UTA is currently working on obtaining compatibility with other EMV ready terminals. This includes acquiring digital certificates from the major credit platforms to allow the UTA check application to be installed on a terminal.